This article is about the type of electric cell. For the military weapon, see anti-aircraft warfare. An AA cell measures 49.2–50.5 mm (1.94–1.99 in) in length, including the button terminal—and 13.5–14.5 mm (0.53–0.57 in) in diameter. The positive terminal button should be a minimum 1 mm high and a maximum 5.5 mm in diameter, the flat negative terminal should be a minimum diameter of 7 mm. 14500 Lithium Batteries are longer if they feature a protection circuit up to 53 mm. Alkaline AA cells have a weight of roughly 23 g (0.81 oz), lithium AA cells around 15 g (0.53 oz), and rechargeable Ni-MH cells around 31 g (1.1 oz). Primary (non-rechargeable) zinc–carbon (dry cell) AA batteries have around 400–900 milliampere hours capacity, with measured capacity highly dependent on test conditions, duty cycle, and cut-off voltage. Zinc–carbon batteries are usually marketed as "general purpose" batteries. Zinc-chloride batteries store around 1000 to 1500 mAh are often sold as "heavy duty" or "super heavy duty". Alkaline batteries from 1700 mAh to 2850 mAh cost more than zinc-chloride batteries, but hold additional charge. Non-rechargeable lithium iron disulfide batteries are manufactured for devices that use a lot of power, such as digital cameras, where their high cost is offset by longer running time between battery changes and more constant voltage during discharge. Another advantage of lithium disulfide batteries compared to alkaline batteries is that they don't tend to leak. This is particularly important in expensive equipment, where a leaking alkaline battery can cause damage to the point of requiring replacement of the equipment. Lithium iron disulfide batteries are intended for use in equipment compatible with alkaline zinc batteries. Lithium-iron disulfide batteries can have an open-circuit voltage as high as 1.8 volts, but the closed-circuit voltage decreases, making this chemistry compatible with equipment intended for zinc-based batteries. A fresh alkaline zinc battery can have an open-circuit voltage of 1.6 volts, but an iron-disulfide battery with an open-circuit voltage below 1.7 volts is entirely discharged. Rechargeable batteries in the AA size are available in multiple chemistries: nickel–cadmium (NiCd) with a capacity of roughly 600–1000 mAh, nickel–metal hydride (NiMH) in various capacities of 600–2750 mAh and lithium-ion. Lithium ion chemistry has a nominal voltage of 3.6–3.7 volts, and are referred to as 14500 Li-ion batteries rather than AA. A variant of the 14500 Li-ion batteries, sold by the Chinese company Kentli as "Kentli PH5" since 2014, comes with an internal buck converter at the positive electrode to downstep the output voltage from the normal 3.7 V to a very consistent (compared to alkaline, NiCd, or even NiMH cells) 1.5 V AA standard voltage. It exposes the normal 3.7 V Li-ion electrode in a ring around the AA electrode for charging. Its more regular voltage provides better drop-in compatibility for alkaline AA devices, and its lithium-ion chemistry provides a lower self-discharge at 3% per month. 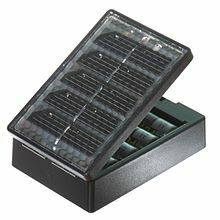 It holds a mediocre capacity of 1600 mAh (1.5 V) at 50 mA drain, limited by the low efficiency of the step-down converter. Nickel-zinc cell (NiZn) AAs are also available, but not widely used. 15D 15A 15LF 14500 1.2K2 1.2H2 ? 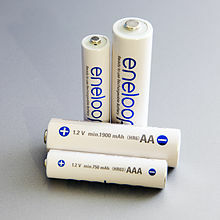 In 2011, AA cells accounted for approximately 60% of alkaline battery sales in the United States. In Japan, 58% of alkaline batteries sold were AA, known in that country as tansan (単三). In Switzerland, AA batteries totaled 55% in both primary and secondary (rechargeable) battery sales. ^ "About Eveready®". Eveready. Retrieved August 8, 2017. ^ "Energizer Alkaline AA Battery Specification" (PDF). Product Datasheet. Energizer. Retrieved October 21, 2015. ^ "Energizer Lithium AA Battery Specification" (PDF). Energizer. Retrieved October 21, 2015. ^ "Energizer NiMH AA Battery Specification" (PDF). Energizer. Retrieved October 21, 2015. ^ Lithium Iron Disulfide Handbook and Application Manual, Version LI4.04, Energizer Battery Manufacturing Inc.
^ Bergveld, H; Kruijt, W; Notten, P (February 1999). "Electronic-network modelling of rechargeable NiCd cells and its application to the design of battery management systems". Journal of Power Sources. 72 (2): 143–158. doi:10.1016/S0378-7753(98)00188-8. ^ "Test of Eneloop AA HR-3UTGB 1900mAh (White)". lygte-info.dk. Retrieved 2019-02-13. ^ "Test of Keeppower 14500 840mAh (Black) 2014". lygte-info.dk. Retrieved 2019-02-13. ^ "Test of Duracell Ultra Power AA". lygte-info.dk. Retrieved 2019-02-13. ^ "Test of Panasonic Super Heavy Duty AA CAN". lygte-info.dk. Retrieved 2019-02-13. ^ Jason Gin. "Teardown of Kentli PH5 1.5 V Li-Ion AA battery". Retrieved April 24, 2018. ^ Jason Gin (2 May 2018). "Completed: Self-discharge test of Kentli PH5 1.5V Li-ion AA (Part 6)". Rip It Apart - Jason's electronics blog-thingy. ^ Gin, Jason (17 June 2015). "Performance analysis/review of Kentli PH5 Li-ion 1.5V AA battery". Rip It Apart - Jason's electronics blog-thingy. ^ "Lithium Iron Disulfide, Handbook and Application Manual" (PDF). energizer.com. ^ Absatzzahlen 2008 INOBAT 2008 statistics. ^ "Wayback Machine" (PDF). archive.org. 3 March 2016. ^ "BAJ Website - Monthly battery sales statistics". www.baj.or.jp. 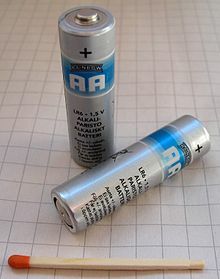 Wikimedia Commons has media related to AA batteries. This page was last edited on 26 March 2019, at 17:18 (UTC).